It’s a long way to the weekend, so let’s make it through with a new car. Enjoy our Hyundai Monday offers brought to you only until the end of October! Hurry don’t wait to find your next ride. All cars must be ordered and delivered between 22nd October- 31st October. A. 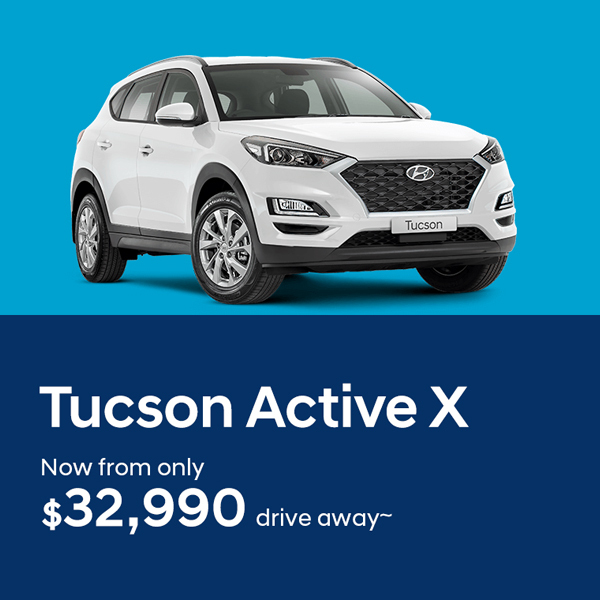 $32,990 drive away price applies to TL3 Tucson Active X Petrol Automatic model with non-metallic paint. 1. Apple CarPlay'” function­ ality requires software update. Apple CarPlay'” requires iPhone 5® or subsequent model (lightning cable) in order to operate. Apple® and iPhone® are registered trademarks of Apple Inc. 2. Android'” Auto requires a device with Android 5.0 operating system or subsequent version, and USB cable in order to operate. Android is a trademark of Google Inc. 3. Leather appointed seats means parts of the seats have a combination of gen­ uine and artificial leather, but are not wholly leather. Drive away price includes the recommended retail price, 12 months registration, compulsory third party insurance, dealer delivery change and stamp duty. Offer valid whilst stocks last and excludes govt, fleet and rental buyers. Hyundai reserves the right to change, supersede or extend these offers at its discretion. Metallic and Mica paint are optional extras and are an additional cost. See your participating Hyundai dealer for details.